(NewsUSA) - Artificial intelligence (AI) is everywhere, and more markets recognize AI's potential to help businesses achieve greater results in less time. The music industry in particular is embracing how AI can help increase productivity and foster creativity. DigiTrax Entertainment is one company on the forefront of the AI in music movement, using AI and machine learning to analyze and create new music. The DigiTrax flagship program, Music Builder, has proven so popular that company leaders will participate in the highly exclusive National Association of Music Merchandiser trade show in Nashville, TN this summer after winning the semifinal round of the 2018 InnoSTARS Competition in Atlanta. "We are thrilled that the discerning panel of judges at InnoSTARS agreed that our artificial intelligence music technology represents a paradigm shift in the way we create and enjoy music," says Joseph Vangieri, CEO of DigiTrax. "We understand the underlying technology that drives the music industry," Vangieri says. "We have an expert AI system for music creation, and we recognized the incredible potential for the 15-billion-dollar music production industry," he explains. DigiTrax boasts a music catalog of more than 15,000 songs, and delivers music to major distribution platforms including YouTube, Google Play, and iTunes, as well as third-party software partners such as Yamaha Music Soft. The ultimate goal for DigiTrax is to change the music industry in the way that CGI (computer-generated imagery) changed the movie industry, says Vangieri. Challenges facing the music production industry are time, money, and the need for an extensive production team that could include composers, arrangers, and musicians. The Music Builder program addresses all three of these challenges, and allows users to create more musical content in less time without the need for specialized staff. The music professionals at DigiTrax are experts in producing, licensing, marketing and distributing music. In addition, their AI technology allows them to offer a service for musicians to quickly and easily compare songs if they suspect their original work has been copied by someone else. "We believe our AI Platform, The Music Builder, will impact almost every area of music, and our seven granted patents will help protect our intellectual property," Vangieri emphasizes. Visit themusicbuilder.com for more information about how DigiTrax plans to turn the music industry on its ears. 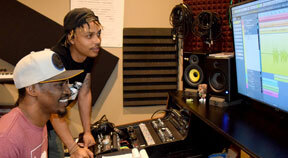 Memphis hip-hop artist "CxRD" using The Music Builder. Photo by Catherine Vangieri.